L-Tyrosine may enhance mental performance by boosting neurotransmitters & fighting stress. Neurotransmitter production. 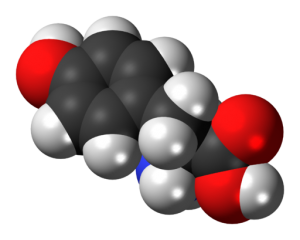 The body uses tyrosine to produce norepinephrine, dopamine, and epinephrine. Healthy stress responses. Tyrosine suppresses production of stress hormones and restores brain chemicals that are depleted by stress. Overall mental performance. Tyrosine supports cognition, mood and memory, especially during sleep deprivation and exposure to environmental stressors. Stress is notorious for depleting the catecholamine brain chemicals that are critical for sharp mental performance. This is because stress spurs the catecholamine system into overdrive, causing it to “burn through” its catecholamines — especially norepinephrine and dopamine — faster. Stress also depletes the body’s natural tyrosine stores. These factors may form a vicious cycle, since stressful situations demand sharp cognition, but also deplete the brain chemicals that enable peak mental performance. If you don’t have enough catecholamine neurotransmitters, cognitive consequences may include “brain fog”, mental fatigue, stress and memory problems. Boost norepinephrine. Tyrosine boosts norepinephrine synthesis in areas of the brain where it is in high demand, and signals for its release during stress. Increase dopamine. Dopamine has been tied to sharper attention and improved alertness, and is a target chemical of ADD/ADHD drugs. Support epinephrine. Epinephrine is considered to be the third major catecholamine neurotransmitter; tyrosine is its nutritional precursor. Block stress hormones. Corticosterone and other stress hormones increase the physical consequences of stress. Our take: With its catecholamine support and other beneficial brain activities, Tyrosine may be uniquely qualified to break the “stress → poor mental performance → more stress” cycle. Beyond nootropic mental performance benefits, tyrosine’s catecholamine support may also hold promise for ADD/ADHD, both of which have been linked to low brain catecholamine levels. In fact, drugs for these conditions work in similar pathways as tyrosine, sharpening attention by producing large spikes in brain catecholamine levels. L-Tyrosine’s bio-activities position it as a leading nootropic for boosting brain chemicals and countering the brain-dulling effects of stress. Let’s see how some of the tyrosine research supports these roles. In one double-blind, placebo-controlled study, 19 volunteers underwent testing on three different days, first eating a snack bar infused with 150 mg of L-Tyrosine per kilogram body weight or a placebo snack bar. Subjects were then immersed in water at 35 degrees Celsius or 10 degrees Celsius for 90 minutes, during which they were tested for mood, mental performance and stress hormones. Results revealed the tyrosine group performed better on memory tests, and required less study time to retain knowledge. In a double-blind, placebo-controlled, crossover study, researchers investigated if supplementing subjects with 100 mg of tyrosine per kg of body weight might help their stress responses when exposed to cold and hypoxia (low oxygen levels) for 4.5 hours. In this placebo-controlled study, 16 volunteers, all young and in good health, took 100 mg of tyrosine per kg of body weight and a placebo on separate days. On each day, the study subjects were tested for their performance on stress-sensitive tasks while being exposed to stressful 90 decibel noises. In the above study, Tyrosine failed to improve performance in easy mental tasks, but significantly improved mental performance in more demanding mental tasks. A double-blind, placebo-controlled trial examined two groups of volunteers who were kept awake for a period of 24 hours and took a battery of tests measuring their mood and mental performance: At the 6-hour mark, the experimental group received 300 mg tyrosine in two 150 mg doses, and the other group received a placebo. The tyrosine group was found to have improvements in the expected declines on measures of wakefulness and mental performance when compared to the control group. Based on these results, researchers concluded “tyrosine may prove useful in counteracting performance decrements during episodes of sustained work coupled with sleep loss.” 10. One study examined tyrosine’s effect on working memory on 20 people asked to perform either a single task or multiple tasks that tested short-term memory, visual & auditory monitoring skills, and arithmetic. The group given 150mg/kg of tyrosine 1 hour before the tests showed a significant improvement in working memory on the multitasking test, when compared to the placebo group. 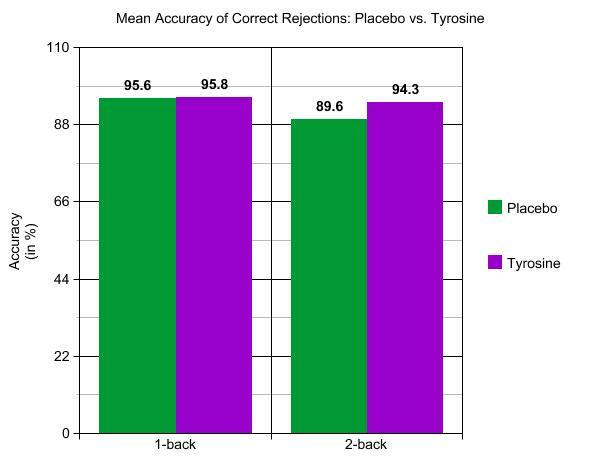 Tyrosine showed a positive effect on cognition in 10 cadets given a tyrosine supplement (up to 2g per day) during 6 days of a combat training course: the experimental group scored higher on measures of attention and memory and also experienced a decrease in systolic blood pressure compared to a control group of 11 cadets given a placebo. 0mg/kg (split into two doses of 150mg/kg). This means that the low-end 100 mg tyrosine per kg bodyweight would translate into an 8.8 g dose for an adult man and a 7.5 g dose for an adult woman. t off, despite appearing different, “tyrosine” and “L-tyrosine” are the exact same thing. Plain tyrosine: Also labeled as “L-Tyrosine.” This is the cheaper commodity form, found in basic nootropic supplements. N-Acetyl-L-Tyrosine (NALT): More expensive than plain, but more bioavailable — absorbed into the bloodstream more quickly and efficiently. s well-tolerated in the studies examined. Some subjects reported minor side effects such as heartburn, headache and digestive distress, but these events were rare. If stress is draining your brainpower, Tyrosine is a “must-have” nootropic. It may also be a good speculative nootropic for those dealing with attention and focus issues. Tyrosine is one of the most evidence-backed nootropics for brain chemicals, and may be considered a “Master Precursor” that’s used to synthesize the most important neurotransmitters for sharp mental performance. N-Acetyl-L-Tyrosine (NALT) is better than plain Tyrosine. Most positive studies use mega-doses of tyrosine, which may not be practical for everyday supplementation. Since it has greater bioavailability, the NALT form will supply more nootropic activity in smaller dosages. NALT 350 mg is a good starting point for supporting brain chemical balance and healthy stress responses.